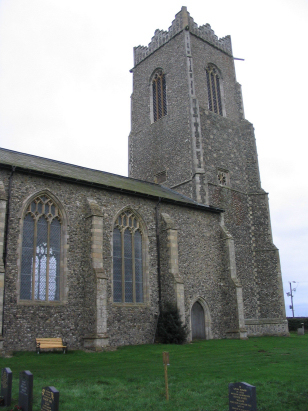 The parish of Walcott sits on Norfolk's eastern North Sea coast about 5 miles east of the market town of North Walsham. Walcott largely consists of a straggle of beach-side properties together with a scatter of farms and cottages across the inland portion of the parish. Whilst it would have largely been an agricultural community the occupations of the fathers in the transcript shows a degree of maritime connections too despite the lack of a safe harbour along this stretch of coastline. Sadly this area is experiencing frequent flooding and loss of land to the sea resulting in a threat to the continued existence of Walcott. Nowadays Walcott largely earns its living from the beach trade albeit at a very small scale as well as from continuing arable agriculture. All Saints' church sits inland and almost 3/4 of a mile south of the main centres of population, a footpath behind the roadside hedge leading past the Lighthouse Inn to the site. 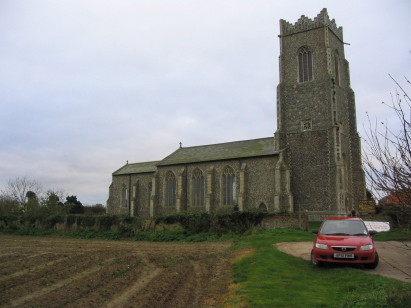 The church is very typical of Norfolk's churches, started in the Decorated era it evolved, probably in a single build, into the Perpendicular style through its construction. Pevsner is clear on the sequence of construction, namely chancel followed by nave and finally western tower but is unclear as to the start date. Documentary evidence places the nave in the early 15th century and the western tower and southern porch following just beyond the mid point of that century. As is usual there was a significant restoration lasting over 20 years between 1854 & 1877 which refreshed and modified the building somewhat. The church sits in hedged grounds with its big western tower almost flush to the coast road, a large sandy pull-in area is just to the north and the site is open and with few restrictions to photography. A single standard 800-entry register book covers not only the period of this transcript but runs onwards to end in the mid-20th century. This register is filmed on Microfiche 4 & 5 in the collection of Norfolk Record Office which were used to prepare this transcript. Regrettably these fiche are rather elderly and their images are poor, coupled with some poor clerical work this piece was tricky to prepare and may contain some misreads as a result. Hopefully they will be few in number but because of these quality issues they cannot be entirely ruled out.